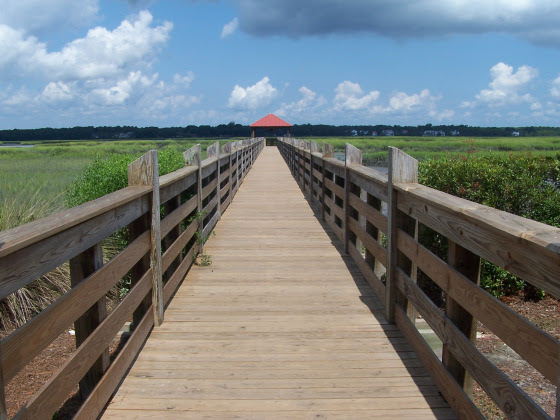 A boardwalk to some destination, floating above the reedy water…A summer day, but with dark clouds hovering just above the horizon…what story does this picture tell? And where the heck have I been all summer? Busy, busy, busy. If you need to know more about my summer vacation, read here. Good to be back – I’ll buckle down and write more often. Adam, this one is for you. Enjoy. Every step was an effort, Adam’s feet scraping the boardwalk. Mindlessly, he shuffled forward, unsure what drew him on. His last memory – a pop, then searing pain, then nothing. Trying to piece together more, it was as though his past had vanished. A red drop hit the wood, a shimmering dot. Adam felt nothing, only knew he had to reach the end. After what felt like years or maybe no time at all, he arrived at the red awning. “Styx Shuttle” was stenciled on the boat that awaited. Adam knew then this was his final trip. He’d come full circle. This entry was posted in Flash Friday Fiction, Nature. Bookmark the permalink. Nice story. I wonder what had happened to poor Adam? An interesting twist on a river that most people want to stay away from. I love the idea of the ferry actually having a name! Does he put the money under his tongue? Inquiring minds want to know. Maybe he can find some rest now, this kind of passing seems exhausting. A shadow-existence.